The Supreme Court will be closed on Monday 3 May 2010 for the May Bank Holiday and no cases have been scheduled for Tuesday 4 May. 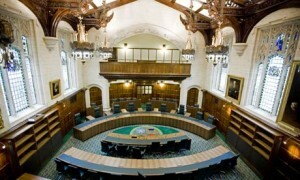 On 5 and 6 May 2010, a seven judge panel consisting of Lords Phillips, Saville, Rodger, Walker, Brown, Clarke and Sir John Dyson SCJ will hear the control order case of Secretary of State for the Home Department v AP. The appellant was the subject of a control order which confined him to a flat for 16 hours a day, away from the location of his family. Our preview article on this case can be found here. Further details about the case can be found on the Supreme Court’s website here. Lord Kerr was replaced on this panel last week by Lord Saville who also sat on last week’s Supreme Court Appeal, replacing Lord Rodger. The latter travelled to Mauritius to replace Lord Kerr on the Judicial Committee last week. These changes can be found on the updated Judicial Sittings List (version 6). The Court has also announced that on Wednesday judgment will be handed down in two cases, both appeals from the Scottish Court of Session. The first is Farstad Supply AS v Enviroco Limited and another, which was previewed by this blog here. The second case is Inveresk plc v Tullis Russel Papermakers Limited, previewed here. The proposed bench for hand-down will be made up by Lords Phillips, Rodger and Clarke. Further details on each case can be found on the Supreme Court website here and here respectively. After last week’s busy timetable in Mauritius, the Judicial Committee of the Privy Council will have no hearings and give no judgments. Leave a reply on "In the Supreme Court w/c 3 May 2010"